Yeah, that was pretty awesome. 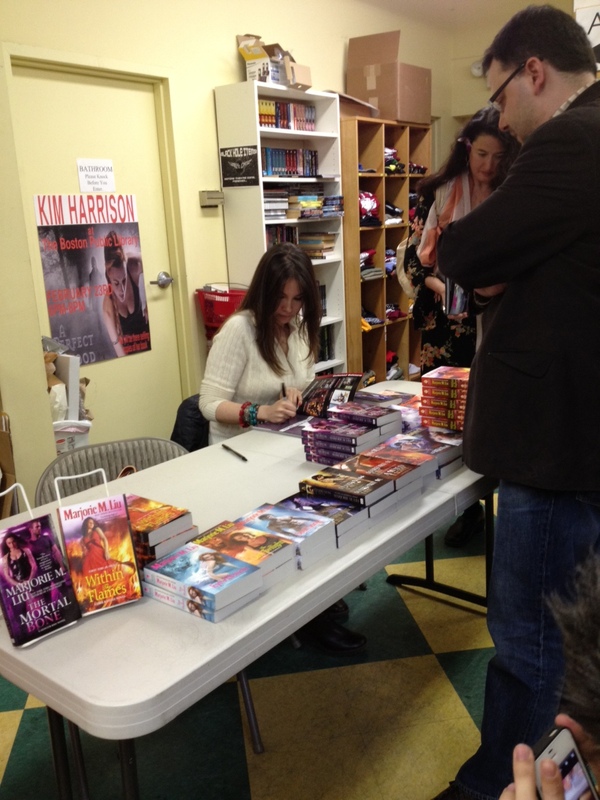 So I went to this signing at Pandemonium Books in Cambridge last night. I found out about it kind of last-minute (good thing I finally signed up to Twitter) and was looking for someone to come with me, which no one did because my friends are lame and don’t like to drive out to Cambridge. Lucky for me, I happen to work in this lovely city, so I’m here every weekday whether I want to be or not. Last night was one of those rare occasions I actually wanted to be here. I mean, I even stayed at work for an extra half hour for the opportunity to meet Marjorie. That’s dedication (right?). I got to Central Square and I basically had no idea where I was going. I’d never been to Pandemonium Books before, and for some reason I was expecting this gigantic, Borders-like book store, which could not be further from what I actually found. It’s a tiny little thing just around a corner off Mass Ave.—not bad tiny, but more like cozy tiny (although it appears they do have a good gaming space downstairs that I didn’t check out), and when I walked in, I was immediately greeted by the kind gentleman behind the counter who asked me if I was there for the signing. I arrived incredibly early—the signing was at 7:00 and I’d gotten there at about 6:15, so I spent some time perusing the shelves and feeling a little awkward. A table of Marjorie’s books was set up in the middle of the floor, with a little over a dozen chairs lined up facing it. Let me reiterate—this place is small. It was a small setup. So while my brain was expecting some sort of grand assembly beforehand, when I walked in and realized we’d all be breathing down her neck, I admittedly got kind of nervous. I’m more of a “hang back” type of person when I go to these things—sit in the middle of the pack, keep quiet, and just wait to get up to the table to get my book signed. No nonstop chitchat from me, no hassling the creator—at most I may ask for a picture, but that’s as far as I go. At quarter to 7:00 when it was just me and one other girl sitting there by ourselves (in the front row, no less), what I thought was panic but actually turned out to be excitement set in. I was admittedly concerned that no one else would show up for this thing—how terrible would that be? Well … I was concerned up until the point Marjorie walked in, immediately began talking to us, and offered to sign our books, that I relaxed a little and thought, yeah, this is completely awesome. Others did arrive, of course, but it was still a tight-knit group, and very relaxed atmosphere—so much so that I broke my “keep quiet” attitude and asked a couple of questions. Marjorie is incredibly sweet, fun to talk to (and listen to), and totally easy going. She read a short excerpt from her new book, Within the Flames, and took Q&A about many topics, from her work with Marvel, to her novel writing, to her opinions on the DC reboot and whatever in between. (I totally meant to ask her about her poodles, too, and I forgot. Damn.) Honestly, some of the Marvel stuff was a little depressing—such as hearing that her pitch for an all-female team book consisting of She-Hulk, Elektra, and Mystique was shot down because it “won’t sell.” We all know Marvel and DC pander to teenage boys, but actually hearing that confirmed out loud by a creator leaves me kind of gutted. Luckily there are still plenty of good things to keep me happy and excited, such as Marjorie’s upcoming run on Astonishing X-Men. There were also plenty of other girls in the audience—girls who read comics and actually know what they’re talking about, and that’s always awesome. We aren’t as rare as you might think. At the end, I shook Marjorie’s hand and thanked her for taking the time to speak with us. She sincerely thanked me for coming out, and I hopped out of the store to catch my late train home, quite tired but very happy. And then the weirdest thing happened this morning (thank you, again, Twitter). Apparently, none other than Mister Junot Diaz had been present in the audience with us last night. I remember looking at him as he asked questions, thinking to myself that I’d surely seen him somewhere before… hmm… he’s sooooooo familiar? Well, it turns out it was Mr. Diaz—a fact I only knew from reading my Twitter feed this morning where everyone basically had the same MIND BLOWN reaction I had. Jesus—this man’s books were practically my college curriculum. Fiesta 1980 is one of my all time favorite short stories. Dude was in the same room with me all night and I had no clue. The event was already awesome on its own, and I’d woken up this morning still floating a little from the high it gave me—to read about that just took it to another level. Two for the price of one. This entry was posted on 02/10/2012 by ravenhaired. It was filed under Awesomeness, Comic books, Conventions & Shows, Female Characters / Creators and was tagged with Boston, Marjorie Liu, Marvel, Mind blown.